Last year, diver Rich Horner uploaded a video of his most recent diving expedition in Bali, Indonesia. The clip shocked the world and quickly went viral. Instead of colorful marine life, the majority of the pinks, greens, and blues were from plastic debris drifting along under the water. His footage showed the breathtaking extent of the plastic problem. Plastic bags and wrappers as far as the eye can see — but not a single fish. While all countries contribute to our oceans' dire plastic pollution problem, Indonesia is one of the biggest culprits. After China, Indonesia is the largest contributor to plastics in our oceans. Alone, the country sends 3.22 million metric tons of the material into our oceans each year. 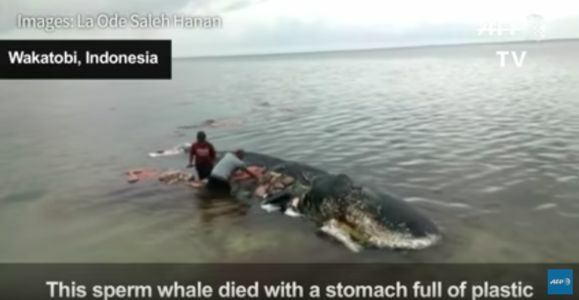 That fact became even more apparent after a dead 31-foot sperm whale washed ashore at the Wakatobi National Park in Indonesia that was stuffed full of plastic debris. All in all, the whale had 115 drinking cups, four plastic bottles, 25 plastic bags and two flip-flops swimming around in its stomach. Scientists can't be sure that the ingested plastic led to its death, but what is certain is that our addiction to plastic is one of the biggest challenges our world faces. And Indonesia, an archipelago nation of 17,508 islands, surrounded on all sides by the sea, means that their plastic waste has even more chance of winding up in our oceans. In recent years, Indonesia's attempts to curtail plastic use have been "relatively toothless" — the plastic bag tax of $0.02 was pathetic and discontinued, and a proposed excise tax against plastic producers was also dropped. All these failures in plastic management make it highly unlikely they will meet their goal of reducing plastic waste by 70 percent in less than 10 years. In reality, there is already a model that works. If Indonesia wants to get serious about dumping their plastic addiction, they need to look no further than countries like Kenya and Rwanda which have banned single-use plastic bags completely. In those countries, breaking the ban can get the offender in real trouble. Serious fines and jail time and have worked so well they won Kigali — Rwanda's capital — the title of "the cleanest city in Africa." It's time Indonesia takes their plastic problem seriously and follow in the footsteps of leaders like Kenya and Rwanda. Sign and ask Indonesia to implement a complete and total ban on single-use plastics.